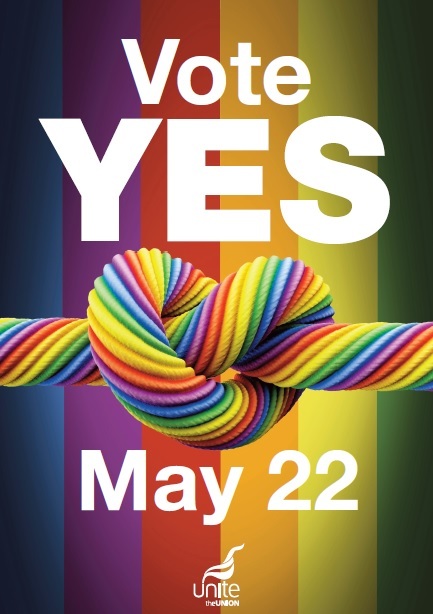 May 17th: Unite is writing to its members urging them to vote Yes in the forthcoming referendum on Marriage Equality. “Last week, delegates at our Irish Policy Conference voted overwhelmingly to support equal marriage and, by extension, this referendum. “The trade union movement is based on the principles of equality and solidarity. Next Friday, by voting Yes, we will all have a chance to show solidarity with our fellow citizens who have been denied equality. “Let us be very clear. This referendum is about one thing, and about one thing only: extending the right to contract a civil marriage to all loving couples who wish to make a commitment to one another. “Unite is urging all our members to go out on Friday, vote Yes, and help Ireland take a further step on the road to equality”, Jimmy Kelly concluded. This entry was posted in Press Releases, Republic of Ireland news, Unite Equalities and tagged equality, Jimmy Kelly, Unite ROI. Bookmark the permalink.